My girlfriend's 2016 CX-3 (GT spec?) has halogen bulbs with projector housings and I am going to be doing a little work to it. 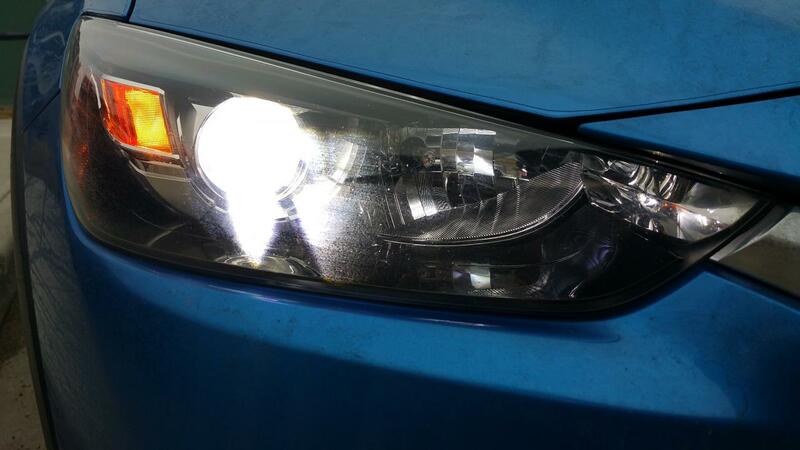 The driver headlight had extreme condensation and was replaced under warranty. The passenger headlight now has extreme condensation and we are trying to get the dealership to replace it. If negotiations do not work in our favor, I will need to fix what has become a greenhouse of a headlight. I have found the posts regarding the removal of the front bumper and headlights (thanks anchorman!). However, how can I actually remove the condensation? A. Keep the light in the house in front of a dehumidifier for a week. B. Disassemble the housing and wiping it dry. Does anyone have pictures or advice? Heat gun and patience? C. What are my options for replacing the housing sealant to make sure this doesn't happen again? The stock halogen bulbs do not provide enough light and are a safety concern. I realize LEDs are more plug and play (no ballast), but can also not be a huge improvement due to the way the light is dispersed compared to HIDs. Having had LEDs, HIDs, and Xenons, I prefer HIDs. They were also 55w, not 35w which played a factor. Can anyone who's had LEDs and HIDs provide feedback on their experience? If the lights are always in the ON position, then they should always have full power to them. If they are in the DRL position, then I assume that HIDs pulling 35watts will be too strong of a draw. Similarly, LEDs may flicker. Can anyone shed... light on this? I think it will not be of much concern if we continue to keep the lights in the ON position anyway. Last edited by Pumanator; 02-22-2019 at 07:56 PM. A less popular but still an option to save time especially if you need to use the car is to use clear silicone on the outside of the headlight along the seams where the plastic lense is attached to the unit (similar spot where you would heat gun it to melt the existing adhesive). Unfortunatly this isnt a guarantee to fix the issue as condensation can enter from basically anything and you would have to do a thorough inspection of the headlight where even a plastic corner could have a tiny crack from the manufacturer letting in moisture. Could also be the gaskets on the bulbs/cover (one or the other have not personally checked which is there). As for the halogen/hid/led portion. This is a bit of a unique topic for the cx-3 lol. The halogens are terrible and should not exist on our cars. Many a review site has proven them to be one of the industry's worst headlight in terms of visibility/spread compared to others. Now you basically have 2 options on those and a 3rd if you are a pro at completely retrofitting a new aftermarket projector housing onto the existing headlight assembly but thats an extreme/highly professional job which might not be worth it considering costs and time etc. Get new oem led housing from the GT models or put in a new bulb type. If you get the LED headlights with the oem assembly as on the GT version, they are much more efficient and powerful in visibility/spread mainly because of the projector housing. The halogens units have a reflector (Im about 80% sure based off of memory for the 2016s) so putting a led/hid bulb on this is going to do the work of making better visibility for you but will notoriously blind other incoming drivers based on the height of the headlight and the spread it will cause. I was a fan of HIDs for a long time because I usually get from a certain amazon company and they have never flickered or failed on me once when properly wired with a relay, however on the cx-3 I can see why the led's might be more efficient without the extra wiring etc. There is also no massive initial power draw that comes from cold starting the hid balasts. Basically if you get the oem projector housing headlights, then it might be easier to stick to leds as long as they match the oem specs. The reason I say oem specs is because theres alot of cheapo sellers on amazon/ebay with leds which are either overpowered, underpowered, or a massive heat generator. The oem led lights have been solid for my usage but after previous attempts of converting other car headlights to leds and having them burn out, im not entirely convinved on the aftermarket world of leds at this time still. DRL wise it may be better to stick to oem wattage/power draw and to also keep in mind the wiring will have to change(add in a relay etc) if you go a different route. Also I am not sure if this is the case with the non-GT halogen housings but is the drl there part of the bulb itself or surrounding lights? The gt led lights have a half ring around the projector that lights up as drl which could be where the low power is intended for. I usually turn off the always on drl feature on the gt but if I recall it only lit up the half ring or "eyelid" if you want to call it that. If it is part of the actual light itself on the halogen assembly then it should be supplying the bulb with the same power as if the headlight was actually on regardless of drl.. at least in logical theory lol. My understanding is the DRL is the low beam, but it is a lower powered version of the low beam which would not be enough to ignite the ballast upon start-up. However, my girlfriend leaves her lights in the ON position as they shut off with the car after 15 seconds or so. The only apparent bonus of the "DRLs" is to have them turn off when not moving -- this isn't important to either of us. Is the scatter of an LED or HID in a halogen projector that bad on the CX-3? I realize there will be some, which can be less with an LED over an HID. I don't want to blind others, but am not paying $1400 for new LED projector housings. Based on Trixstar's post, I'll probably be best off running quality LEDs to avoid an HID wiring harness to keep things simple. BUT, I'm worried the throw won't be very far. The halogen headlights consists of the lowbeam projector and the high beam reflector. If you are installing an hid kit for the lowbeam halogen capsules, it is best to use a HID wiring harness. The harness will connect to the battery, the frame of the car and also to the lowbeam bulb socket. This will help it to know when to trigger the HID ballasts so that your auto on headlight feature will function normally. Has anyone installed 35watt HIDs with the DRL as the low powered, low beam? Last edited by Pumanator; 02-22-2019 at 09:37 PM. Oh wow I dont know why I never realized that it has a projector. It always looked like a reflector housing on quick glance and I think some of the really old posts called it such which is I guess is why it stuck with me. In that case, I would see if theres a cutoff line. You should be fine switching over if there is a horizontal cutoff line in the spread. True reflectors just blast everything in front of you and blind people off. I think someone also said that on the halogen headlights you can adjust the positioning of the beam itself which might be something of interest if you want to go down that route. Unfortunatly I cant comment on the drl shared wiring signal component. I would suggest a test to see if theres a difference at night between drl and lowbeam setting. If it is almost negligible then there shouldnt be much of an issue. I believe it would be relayed anyways since that would be the smarter/safer route for the manufacturer but would need wiring sheets to confirm. I totally agree that new oem price for the led projectors is terrible lol. This is one of the few times I would be open to looking at ebay sellers for it but theres bound to be a little wear, and as long as all of the tabs are connected (especially that back one that holds the box clip for the bumper pin to slide into otherwise your front bumper will not align). The light output/cut-off with this kit has worked very well for me. The CX-3 projectors are definitely not the best on the market, but for me this upgrade made the lights very good. For those voicing concern about the light cut-off, it is very clear/crisp and does not appear to be blinding other drivers (no one has flashed their brights at me yet... besides speed trap warnings ). The install is straightforward. The most difficult part was changing the plugs on the ballasts so that they would match the factory plugs/harness. These plugs (male connectors) were included with the kit, so really it was no big deal. I also got the capacitor just in case the DRLS would be left on. If you get this kit and have any install questions just shoot me a PM. Just as an FYI, the 50 watt ballasts with H11B 5500K bulbs have a pure white color with just a bit a blue (excellent lumen output). They look like OEM HIDs. I think someone also said that on the halogen headlights you can adjust the positioning of the beam itself which might be something of interest if you want to go down that route. Unfortunatly I cant comment on the drl shared wiring signal component. I would suggest a test to see if theres a difference at night between drl and lowbeam setting. If it is almost negligible then there shouldnt be much of an issue. I believe it would be relayed anyways since that would be the smarter/safer route for the manufacturer but would need wiring sheets to confirm. The model we have is a 2016 Touring. This is the mid-level, below GT, but above the base. However, my girlfriend found a new Touring in Dynamic Blue with extra features including the sun/moonroof and Bose speaker package. It's only missing the LED headlights and GT wheels when compared to a GT model. I checked today and there is a noticeable difference in light output for DRL mode versus headlights on. The light stalk twists from OFF, DRL, ON. When set to off, they are obviously off. In DRL mode, they are only on when not in park -- in park, they are off. When set to ON, the light output is noticeably brighter. All this to say that the DRLs are the lowbeams in a low powered state which could mess with the wiring without running a harness. My girlfriend always leaves her lights on (they turn off within 20 seconds of shutting the car off) so there's no obvious benefit of running DRLs to us. Last edited by Pumanator; 02-23-2019 at 10:01 PM. So you have a harness on. What is your situation with the low powered lowbeams? I'm guessing the feature of DRLs exists but it's just the high powered HID kit since you have a relay, not a low powered HID output. I would guess the power draw from the low powered DRL won't be enough to fire the ballasts so if I go HID, then I'd need a harness. Would you have any pictures of how you ran the wires? Can you explain where the capacitor sits? I'll have to check the retrofit/morimoto site to see if they have diagrams. I'm tempted to run a harness but I've been told to not screw with too much I had a 55w 5000K on my last car and they were amazing. My current Mazda3 s GT has D2S bi-xenons with Adaptive Front-lighting System. With those two experiences, I feel like I'm driving with a handheld flashlight in the CX-3, especially in the rain. In that case it might be easier to go down the led bulb route. Hids seem to have issues with the drl based on that initial link to the old post (that I just now saw lol). I would think if you wired the trigger cable to an after market relay to the battery, any sort of current to it would most likely activate the relay to start the hid bulb and power it from the battery which should theoretically correct the issue with the drl not working but I am just speculating based off what I have done on other cars with similar setups. Led bulbs might be easier to avoid all the extra wiring but space might be an issue with them since some have massive heatsink/fans which may need accomodation on the headlight assembly. To my knowledge the leds should be able to turn on with a lower power output similar to the oems but then again it would depend on the type of led the seller has since some pull more and have a higher starting/operating threshold. With regard to the DRLs, the HIDs fire and do not flicker with the capacitor. So just in case they are accidentally enabled, it should not damage the ballasts. The capacitor plugs into the factory wiring and then the harness. Super simple to install and plug and play. There is no specific CX-3 guide online, but really there is no need. It is THAT simple. With regard to the harness. This is honestly the easiest step. You plug the harness to the battery and a ground. No need to tap any wires or anything. This harness then powers the ballasts. You use one plug from the factory lights, and that plugs into the harness and acts as the on/off switch. I just put electrical tape around the other plug and tucked the connector away. There is absolutely zero modification to the factory harness. I can take out the HIDs with harness in probably five minutes and it will be back to stock. So no need to fear HIDs because of the requirement of a harness. If you decide you want to go this route, I will take pictures of how I routed the wiring. Again, this was basically plug and play with the exception of changing out two connectors (that come with the kit). Last edited by TiGrayMSM; 02-24-2019 at 01:41 AM. I'm about to run HID's on ours, I was able to disable the DRLs by going into the settings menu and turning them off for good. 3 Attachment(s) Go to first new post website bug?